Hey all! Before I embark on another few big adventures (starting with a 125km Trail Running Race at the UTHC, and followed by 3 weeks in NEPAL!! ), I wanted to take things down a notch. Specifically, I wanted to address any concerns people might have that I spend all my time training and racing. Truth is, that is only one part of my busy, fun life! I can assure you all that I have a lot of other interests, and that I definitely do my share of relaxing and recovering (sometimes more than I should methinks… I *could* be on the podium more I suppose if I tried…). With that, I bring you a short post on a few fun things I did in the last week. First off, I got on a jet plane and headed to Vegas, baby! Now, ostensibly, I was there as part of my job, attending a conference on the mobile wireless industry, but it was Vegas nonetheless. And, seeing as I have a couple very good friends who live down that way, I was able to head down a few days early, stay with them, and have some quality pool and trekking time! In addition to visiting them and taking in the strip, I also managed to sneak away with Troy to the nearby Red Rocks park to do a little bit of light trekking and test out the 4×4 capabilities of Troy’s Jeep Liberty. We brought a couple of the dogs along with us and made a day of it. I think my favourite part of visiting this part of the world is the fact that Mexican food is plentiful, and delicious. I’m a bit of a taco fan, and managed to each Mexican almost every day down there! Add in the tasty new beers I sampled, and cool gadgets I saw at the conference, and it made for a relatively enjoyable “work week”. The only downside was the fact that I spent most of the late nights catching up on real work from the office! To cap off my week down there, I was extremely fortunate to score a ticket to see Love, the Beatles-music inspired show from Cirque du Soleil. This was a really amazing show with spectacular acts and awesome music. My biggest challenge while at the show was trying to figure out exactly where to focus my attention. There were acts on the stage, acts high up in the air, and other acts in the wings pretty much the entire 90 minutes. I think I could watch the show 3 times and still see new costumes and feats! The second bit of fun that I wanted to share actually straddles the line between fun and racing. 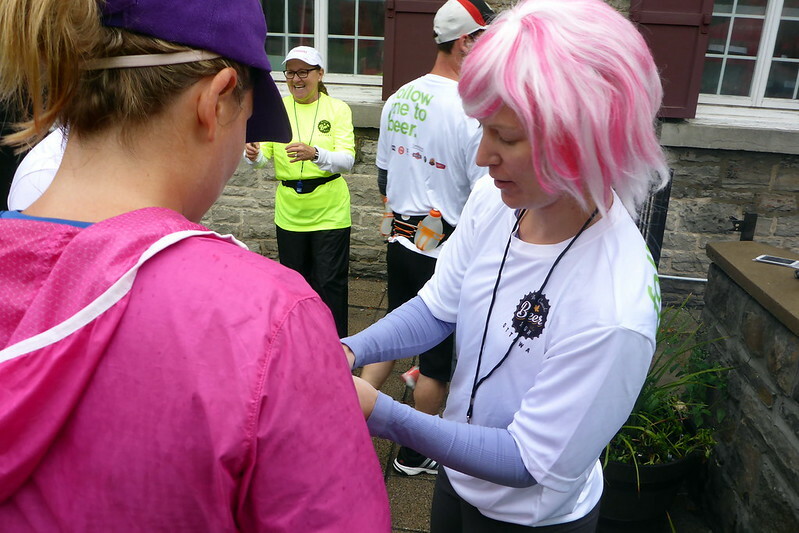 On a whim, I volunteered to be what is known as a ‘Beer Bunny’ at the Ottawa Beer Run. When I read the description of the event, I realized that it is what I’ve been training for my entire life :-). 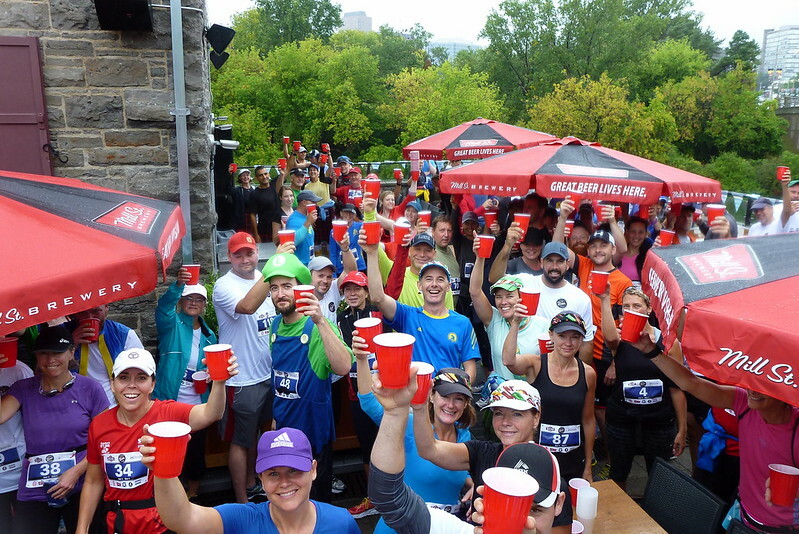 You literally run from brewery to brewery, sampling the beers, and finish off at a big post-race party with even more beer! All in all, we were visiting a total of 5 breweries for my ‘wave’. There were two route options, so of course I chose the longer one, at 15k (I pushed closer to 17k with some back-and-forth running I did with my group). 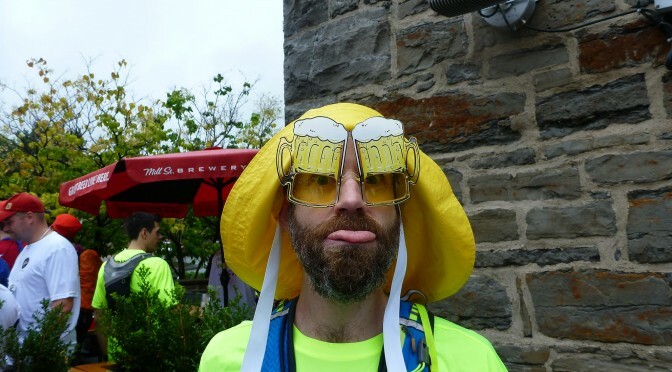 As a beer bunny, I was more of a ‘crowd control’ and ‘beer shepherd’ dude than a pacer. We had to try and get everyone to each brewery in a certain amount of time, and also make sure they all cleared out after about 20 minutes. In addition, since the course wasn’t marked heavily, nor were there any road closures for it, the 4 ‘pacers’ in my wave spent time going back and forth making sure everyone made the right turns and were having a good time! All in all, it was a BLAST! I definitely want to do this one again in future years, provided it works into my always-busy schedule. It was fun chatting with people and helping them get to that next beer that was always waiting for them. My wave visited Lowertown Brewing, Mill Street Brewery, Kichessippi Brewing (in a ‘mobile’ location on Bate island), the Clock Tower, and finished off at Beyond the Pale. Some of the bars even had snack food waiting. For example, at Clocktower, not only were we early tasters of the seasonal Pumpkin Ale, but we also had POUTINE!! Does this event not sound like a match made in heaven? Although the weather had started out quite foul with heavy rainfall the entire day before and overnight, when we actually hit the road, it was barely raining anymore, and the sun even poked out a few times. All in all, it was an ideal time to run. Also, there was no pressure whatsoever. No timing chips. In fact, we would end up bunching up when the group hit red lights that we had to wait together at before moving along. If you are looking for a little motivation to do a longer run, I highly recommend this. With the entry fee, you got a nice tech t-shirt, 5 stops at breweries to have at least 8 ozs of beer at each, and a really cool medal that doubles as, what else, a bottle opener! To round out the fun of that event, Deanna also volunteered to be a ‘Brewery Captain’ at Mill Street, helping us get our bibs punched and beers drank before sending us off to the next venue. That meant we re-convened at the finish line, and I could enjoy a few more beverages before having her drive my tipsy self home :-). 3 Cakes, 3 Kegs and 3 Cheers to 40 Years!! 40. It’s just a number, isn’t it? Well, I would argue the answer is both yes and no. Having recently attained this milestone in my life, I thought I should wax philosophical about my entry into ‘middle age’ and moving into a new decade. However, that is a bit challenging and difficult. I’m not quite ready to start talking about shaking off this mortal coil, or anything like that. So, I’d rather just focus this post on the awesome party that Deanna pulled together to celebrate. After all, your life is defined by your experiences and your relationships, isn’t it? I’ve been blessed to have both in spades to this point, and this post is at least an opportunity to acknowledge that. Have I gotten any wiser in my age? I think so. Any more mature? I certainly hope not! What’s the fun in that? With that, please read on for a bit more detail on my 40th birthday celebrations. Off the bat, I would say that it likely wasn’t fair for poor Deanna to be faced with the task of meeting my expectations for a ‘blow-out’ for my 40th. After all, I’ve been imagining this party for quite some time, and all sorts of crazy ideas surfaced. 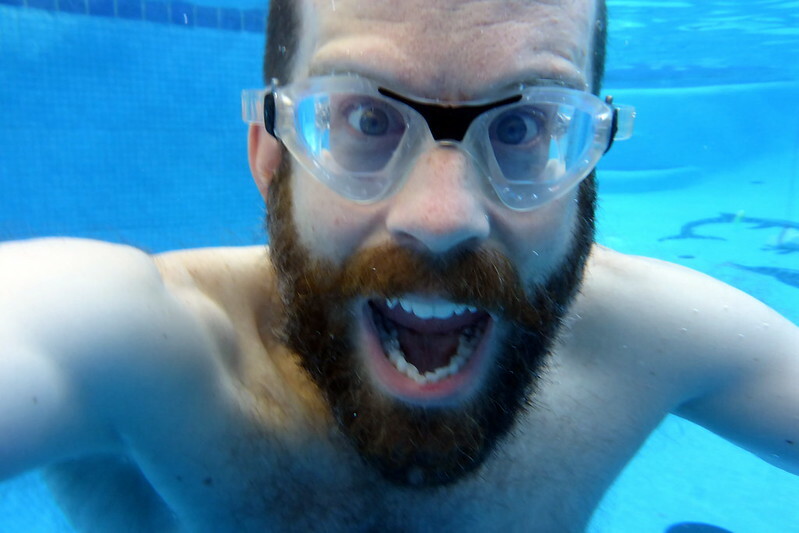 However, now that the time was upon us, the reality was that I was not going to be sky-diving into my backyard pool and have a 3-day on-site music festival. The permitting alone would have been too complex, and funds just a little too tight. Guess those things will have to wait for the 50th!! What we did have was an awesome party with a great range of friends spanning several decades of ‘experiences’ that I’ve shared. In addition, we had 3 delicious kegs of beer and lots of other beverages to keep people ‘hydrated’ and smiling. And yes, there were in fact 3 cakes as well. Two were beer-battered bacon topped monstrosities of awesomeness, and the third was a kid-friendly simpler cake. Needless to say, all kegs and cakes were consumed by the masses by the time the evening / morning drew to a close. The weather wanted to play tricks on us, deciding to unleash some pretty heavy rains throughout the day, but by 7pm or so, things cleared up and merely left us with brooding skies and a wet deck. To give Deanna time and space to prepare, I left the house earlier in the day to go for a long run. 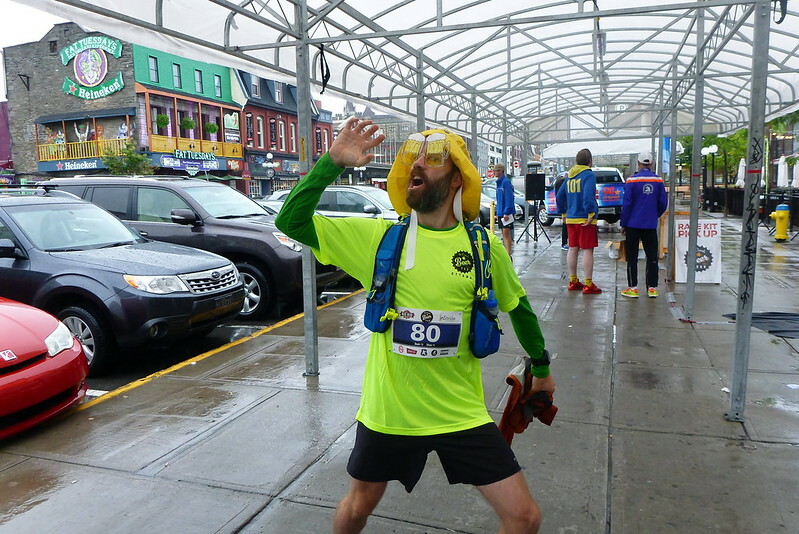 I laughed out loud as I ended up runninng through some of the heaviest rains I’ve ever experienced in Gatineau Park…. at the FURTHEST point in my run! Happily, the weather did NOT stop us from enjoying the pool, hot tub, and fun games in the yard. We ended up forgoing the giant outdoor beer pong match in the front yard (till the next morning), but we DID have a super-cool scavenger hunt. In a nod to my adventure racing spirit, Deanna had set up 10 mini checkpoints with clues scattered around our yard, our neighbours yard and the neighbourhood. It was really fun watching people scattered around our little ‘hood searching for the clues. With each CP was a letter or letters which could be unscrambled to ultimately spell ‘Artisans Alehouse’, the name we’ve attached to our humble abode. Ironically, I was one of the LAST to unscramble the answer, much to Deanna’s amusement! For the most part, the fun was in simply hanging out with so many great people that I’m proud to refer to as my ‘family’. They came from all over, comprising people I’ve been hanging out with since University up to my latest family of endurance training and racing friends and new neighbours. Lots of great conversations and ‘cross-pollination’ all around. And of course the best wife ever, Deanna, and her sister Cheryl to round out the ‘family’ side of things. Sadly, no blood relatives were in attendance, but plenty of well wishes had been sent our way from all over the world (Switzerland, Netherlands, Belgium, Montreal, Nova Scotia, South Africa, Las Vegas, and Australia to name the more ‘exotic’). The music was continuous, and as the night wore on, the obligatory dance party busted out in the lower level with plenty of laughs and funny hats. Outside, tiki torches were lit, bathing suits donned, and kids and parents enjoyed the hot tub and the pool. For the main course, we kept things simple by going with BBQ sausages, but that seemed to keep the hungry masses more or less satisfied, especially when it was paired with the many other snacks and side dishes laid out in the dining room. As the hours rolled by, the numbers dropped, but the noise levels and silliness continued to increase. My self-proclaimed goal was to stay up until at least 5am, since that was the actual hour of my birth a mere 40 years ago. I’m happy to report that I was the last man standing (or rather, sitting at that point), making it all the way to 5:20am. Big shout out to my closest circle of buddies (Matt, Rob, Andy, and Dave) for crashing overnight and making it the perfect ending to the night. In addition, my new neighbour Mark also showed he was no slouch by also being amongst the last people there, and also providing the 2-keg kegerator and helping with some set-up and tear down. It’s really great to finally live somewhere that I feel like I’m part of a ‘community’! At one point, the remaining 4 guests along with Deanna and I were soaking in the hot tub, and Mark was actually fetching beers for us! Now THAT is service! To complement the memories that I will hold in my head of the night (and perhaps supplement some of the ‘blanks’), we tried to do some documenting of the festivities. I’d set up a ‘truth booth’ where people could record personal greetings to me, and I also wore a GoPro for several hours snapping a picture every second. The results of these two experiments were mixed, so I have yet to put together a final video. If I do, I’ll post it on YouTube. Otherwise, it’ll just stay in the ‘personal files’. We also had a couple cameras floating around to take pictures, so I’ve put up some of the best shots on flickr. Thanks to Dave McMahon for snatching one of those cameras and wandering around taking all sorts of pictures of guests for us. All in all, this was definitely a night to remember, and I’m so happy so many people could share in the merriment with us. Between the many beers and other random shots that were consumed, I was not exactly a happy camper the next morning when Rob insisted I get out of bed and celebrate more! At 9am, I was being physically kicked out of bed to join Matt, Dave, Andy and Rob on the deck for fresh beers. Although I was definitely not feeling great, I was handed one to drink. After that, Rob wanted to try his hand at giant outdoor Beer Pong, which he and Andy did as I watched on (laying prone in the grass). I can’t help but look back and laugh at that. It must have been quite a sight. Once they finally packed up and left around noon, I crawled back into bed to ‘recover’. As it turns out, the rest of my ACTUAL birthday, which was Sunday, was very low key. My sister and family initiated a Skype call which I woke myself up for in order to talk for a while. We shared some laughs, and I opened a gift they had sent me and saved to open in front of the kids on the video. It was pretty swell. I only talked to my dad the next day as well. As for my birthday supper? Well, let’s just say I only made it as far as the closest McDonald’s for a feast of terrible comfort food, which I enjoyed while laying on the couch watching something on Netflix. Not exactly a fancy birthday meal, but it had to do. I only felt slightly bad for having not trained that day, but in truth, that was pretty much what I had planned! With that, I will close off this post. As mentioned, I truly feel lucky to have such wonderful friends and family, and such an exciting and eventful life. I have never taken it for granted, and certainly don’t plan to start. Since I live in the present, every day is a gift! With that, we found ourselves a mere week away from the next adventure, Rideau Lakes Bike Tour, a 350km weekend bike tour from Ottawa to Kingston. Stay tuned for that next post! Till then, may your days be sunny and warm, and if they aren’t, enjoy the refreshment of rain! Every now and again, life throws you a bone. And even more infrequently, your employer might throw you a bone. Or in my case, you may be able to parlay your way to a decent work trip to attend a conference in a city you’ve always wanted to visit. For this post, I’m going to talk about the fact that I recently got to spend a week in New Orleans for an IEEE Conference. The location of this conference changes yearly, but this time it was in New Orleans. I was down there from Monday – Friday, and although Monday and Friday were primarily the travel days, I still found some time in the schedule to satisfy my curiosity on all things NOLA. As it turns out, the conference was *very* technical focused, with a much of the content frankly over my head, and not as closely related to my day-to-day work as I’d hoped. As a result, I felt it justified to play a bit of hooky from the program in the later afternoons. As a result, I managed to see at least peripherally a lot of the sights and locations, got out for a couple nice runs downtown and along the levy, as well as a few other adventures. Below are some images I captured in my travels, and read on for a little more about my time in N’awwleans. To make the most of my time, my adventure started the moment I arrived downtown. I had no sooner checked in and dropped my bags off that I left on foot to get a feel for the town and stroll through the French Quarter and ultimately Bourbon Street. My takeaway is that Bourbon Street is a more brazen and hedonistic strip of humanity than Las Vegas! It felt like a permanent bachelor party on Bourbon, where every bar is a dive bar. Not only that, but most of them feature some sort of live music. This is a scene that would have been very dangerous to the younger version of me! One night there was enough to satisfy my curiosity. I had a couple tasty local beers and caught some decent blues at a small club. The next morning, I *almost* got my first view of the Mighty Mississippi. Why almost? Well, there was a thick fog covering the river giving it a very ghostly appearance, but overall very cool to see from my hotel room which was looking out over the river. After sitting through most of the day’s program at the conference, I laced up my shoes and went for a nice 10k run along the river on this side of the river. I got caught out in some really heavy rains, but still enjoyed my run which included running through some of the really old neighbourhoods and ultimately ending up near an abandoned naval yard looking out on the river. The run worked up quite a thirst, so I made a plan to hit a few breweries for drinks and food before more music. The plan involved a first stop at the Gordon Biersch Brewery, which had an impressive selection of beers for a ‘chain’ brewery. Over the next 2 days, I ended up sampling them all, with some great results. I also got to meet with (and ultimately have my tab picked up by) the brewmaster. From there, I wandered over to the Crescent City Brewhouse. They specialize in oysters and beer brewing. The former didn’t interest me, but the latter did. Despite that, I ended up sitting at the bar with another out of towner hanging out with the head oyster shucker. We had a great time just chatting and passing the time away. By the time I stumbled out of there into the rainy night air, it was time for some live music. This time, I was headed to an area called Frenchman Street, which is known for local music made by locals for locals. Ultimately, I landed at a club called dba to see the Treme Brass Band. The venue is pretty well known, featuring a good beer list, and an ever-revolving list of visiting musicians. It was the perfect end to my night. It took a while to walk all the way back to my hotel, but the trip was well worth it. The next day was split between the conference and more exploration. I managed to take a ferry across the river early in the morning to squeeze out another 10k run, this time along the pedestrian path along the levy on that side. 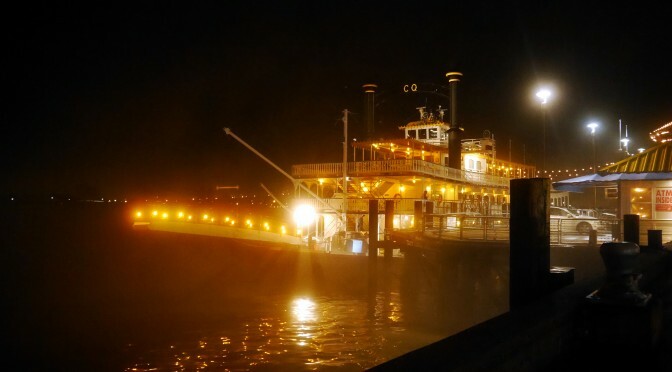 I doubled back in time for the conference for most of the day before ducking out early to catch a steamer boat tour on the Steamboat Natchez, a classic steam-powered riverboat. What better way to experience the river, right? Unfortunately, it was still quite foggy, but overall, I really enjoyed the cruise, which included live Dixieland music on the boat, and a narrated tour of the sights we could intermittently see. To cap off that day, I had an evening social event as part of the conference at the Aquarium of the Americas near the hotel. We had our meal there, and also had free run of most of the aquarium, which was a nice excursion, particularly considering it was still raining out! On my final full day, I started my morning before the conference by heading out to Cafe du Monde for some world famous New Orleans Beignets. These are basically the NOLA equivalent of Beaver Tails to us. Deep fried batter with icing sugar on it. Delicious though. Combined with my hot chocolate, it gave me the energy to sit through more technical proceedings. But that afternoon, it was time to cap off my touring. Rather than walk everywhere, I picked up a day pass for the ubiquitous streetcars and used them for my next few stops. First up, the Carousel Bar at Hotel Monteleone, where I tippled the expensive yet very cosmopolitan Sazerac, the official cocktail of New Orleans. While there, I enjoyed the conversation with both the bartenders as well as a local who had left after Katrina, but still returns regularly to the city he loves. Sadly, I had more adventures to tackle, so I bid adieu and caught the next streetcar to visit one of the newest breweries in town, Courtyard Brewing. It was very quiet on my visit there, but all the better for sampling. While they only brew a few onsite, the have a 16-tap tasting room with lots of visiting taps from other breweries. It was definitely worth the stop and talk with the brewmaster and other passers-by who came from other breweries. It was a great find, and well worth looking up if you are there! Next up was a bit of culture, as I stepped off the streetcar once again and wandered aimlessly through the famous Garden District, including taking in the haunting Lafayette Cemetary. Unfortunately, they were just closing up as I arrived, so I only had about 10minutes to stroll around the tombs. Frankly, it was enough to get a sense of this place. Very interesting place steeped in history. With my head now clear and a bit of food in my stomach, I made my way to my final destination: the Tap Room at NOLA Brewing. They’ve only been at it for 8 years now, but they have some very inventive brewers there, and lots of interesting brews to try. While I had planned on just a flight and a couple samples, I ended up sticking around for more than 3 sample flights, and was also treated to a few special brews as a guest of one of the owners. They pulled some additional growlers from a special fridge for me to try. It was damn near impossible to admit that I had to leave at the end of the night. As with all my stops, the locals were incredibly friendly and more than willing to converse with a traveler passing by. Well, that about summarizes my trip to the Big Easy. My impressions and summary would be as follows: Warm, friendly, interesting personalities, great music, strong spirits, resilient people, and a genuine appreciation for living life as it should be lived. Locals have definitely gone through a lot in the past decade, but their love of life and their culture lives on and grows down there. I’m glad I finally got to visit, if only for 4 nights. I’d say I got a great overview of the Big Easy, and left feeling like I learned a bit more about this city that moves along with the Mississippi. That just leaves Austin and Nashville as the 2 other cities in the U.S. that I’d really like to spend a week in. Guess I’ll have to keep an eye on the conference calendars! Till then, come on back for more race reports! First up, a few pictures of the home as it was when we viewed it. There will be plenty more pictures as we convert it into our ‘home’, but for now, it certainly gives you an idea of our dream house. As you are all no doubt aware, a little over a year ago, Deanna and I said ‘I do’ to one another. There, in the brilliant fall sun and colours, surrounded by friends and family, in a rustic country setting, we set about our lifelong commitment to one another. Sickness, health, richer, poorer, and all that stuff. To us, it was also a commitment to continue exploring and adventuring together, and trying new things and experiences. During our courtship, I had two options; pick up stakes and move to Toronto, or convince Deanna to move from the City of Toronto to the ‘burbs of Gatineau. Self-reflection and a bit of discussion, and it was very clear that I would possibly whither and fade away if I were forced to live in a big city. I needed my park and easy access to trails, water, hills, etc. So with that, Deanna moved to Gatineau, and embraced snowshoeing, cross-country skiing, cycling, and trail running with me and a band of merry friends. As time passed, we discussed long term plans. Cabin in the woods? Condo in the city during the week? That was a vision we had, but eventually determined that carrying two mortgages and only part-time solitude might not work. So what were we to do? Well, for whatever reason, early in the summer, we started looking at properties for sale. At first, we thought it was just for fun, to “prepare” for the day when we’d pull the trigger. But then a funny thing happened. One evening, as we were sitting together going over ads and admiring pictures of some of these places, we looked at each other and said “are we serious? Are we really doing this?” The answer in our souls and heart was YES! We decided then and there we’d focus our efforts, and even put our house on the market on a whim to get the ball rolling and apply pressure. I’ve gotta say this. Looking at pretty pictures is one thing. Even viewing houses is a pretty fun and easy thing, BUT, when it comes to finally putting in offers and also trying to successfully sell your house is a whole other, and more stressful, thing. But as many of you know, I’m pretty organized, methodical, and pretty decent when it comes to negotiations. With that in mind, we opted to undertake this whole ‘project’ on our own, ultimately both selling our house, and buying our new one privately. Frankly, I find having that personal contact, and ultimately more control over presentation and negotiations to be better for me, but it is definitely not for everyone. Agents have a place in this world for sure, it just wasn’t for us. Armed with a glimmer in our eyes, and a general idea of what we wanted, we started out how all other house hunters do, and the way conventional wisdom dictates. We viewed houses. A LOT of them. Whenever we could. We’d squeeze in visits between work, training, and races. At one point, we realized we’d viewed pretty much every house for sale in the Chelsea area, and regions much farther north (think past Wakefield!). Ultimately, we again searched our souls to zero in on exactly where we wanted to live, and it complicated matters a bit. Our criteria was to be able to still cycle commute easily to work, be in Chelsea (on the east side of the park), and ready access to the park, while having our peace. That eliminated a LOT of places. We had to increase our budget, and also be willing to look at tradeoffs like living right off the 105 for example. Time never seems to be on your side in a real estate transaction. With limitless funds, you could carry two houses, allowing you to move on a house you love before selling your own, but we were NOT in that position. What’s worse, in our current area, it seemed almost every other house was for sale, casting doubt on our ability to sell reasonably quickly. However, as with any endurance race, you can’t worry about what lies ahead or any particular suffering, you have to live in the moment and do what you know you can do. So with that, after spending a long visit at one particular house, we reviewed all our criteria, and realized that this particular house was pretty much the best fit. It was by no means perfect, was 30 years old, and didn’t show particularly well based on its current state, but something about it sang to us. With some excitement, we booked a second viewing, and headed off with a head full of excitement, a measuring tape, and me having run a number of scenarios on reasonable opening offers, After all, in Quebec, you can actually look up the selling and buying prices of every property transaction, as well as the municipal evaluations, etc. We had a great visit, and at the end, we all sat down so we could discuss next steps. And that, my friends, is when they told us it was too bad w hadn’t come forward even 2 days ago, as they had received, and accepted a conditional offer just the day before! We were crushed. Before leaving, we openly chatted more with them about this offer, and I managed to actually wrangle from them the exact price of the other offer, which was in line with my hoped-for final offer price. I asked if we had any options at this point. The indicted they actually would have preferred dealing with us (long story there), but legally speaking, our only hope was to make an unconditional offer on the house. No inspection, no clause about financing, not clause about selling our own house, etc. Unfortunately, we hadn’t even gotten our house listed online yet. The pictures and copy were just being finalized, and would go up in the next couple days. We left dejected, knowing there was little hope. The other offer had a 30 day window basically to close on financing, etc., so we knew we had to walk away and keep looking. After dusting ourselves off, we picked back up, and continued the quest, once again raising our price ceiling again to capture a few more ‘gems’ that we knew were out there and wanted a chance to view. Concurrently, we got our house listed. So now we were also putting another ball in the air, which was dealing with people wanting to visit our house. Luckily, I was actually off during that time, so I had the ability to get the house properly staged, store the clutter elsewhere, and manage the whole process. Feedback was good, and the first few showings went really well and gave us hope with respect to selling. We’d priced the house competitively, and it was in great shape. Buoyed by this, we got serious about buying again. We found a house that we instantly loved, with a gorgeous sunroom, ample room, big yard, and even deeded access to the water, located just off the 105 between Scott Street and Old Chelsea. After returning home that night and discussing it, we decided we’d prepare an offer to send to them quickly, before missing the chance. We purposefully priced it on the lower end of the spectrum, knowing it would buy us a bit of time with the back and forth, hopefully giving time to sort our own house out. Unsurprisingly, the offer was rejected, and countered with a price still a bit rich for our likes, but keeping the door open. We decided to sit on it a few days to see what might happen. After all, I was actually heading to NS for a week. Then, some magic happened. We managed t coax not one, but two offers on the house. I say coax, because I basically called out two viewers who had both indicated they planned to make offers, but hadn’t yet. I contacted each to let them know someone else was interested, and we were expecting offers imminently. I worked, and both sent in offers the next day. The game was afoot. A little more back and forth, and it looked pretty definitive that we had sold the house! Now what? Well, with the time that had passed, I decided to go for broke and called back the folks with the first house we’d lost out on to see where they were. Expecting it was too late, I was elated to learn the other people hadn’t yet removed their conditions, meaning that an unconditional offer was still an option. The world will tell you don’t EVER make an unconditional offer, but I’m not most people, and what’s life without a little adventure? Deanna was onboard, so I hastily drafted an offer while in NS. I electronically signed it there, Deanna electronically signed it in Midland, ON, and we sent it to BC where they were currently vacationing. I should point out that in our visits, I’d inspected a lot of the house’s structural work already, and had also viewed a complete inspection that had been carried out. Having grown up in a house that my dad built around the same time, I know my way around a house. In other words, I wasn’t going in completely blind. The offer was now in the ether, and the next 24 hours were a bit nerve wracking. Happily, the next day, we got a great surprise. The offer was accepted as is, and the other people had even been told their offer was now null and void. After some legal calls, it was determined that while the other offer normally has a 72 hour clause for a counter offer to be made by the other couple who made an offer, that clause had become null and void based on another clause that stated proof of financing had had to be made within the first 10 days of the offer. They had not done that, so the entire offer was scrapped, and ours was the winner!!! We had sold our house AND bought a new one, pretty much all while I was on vacation back east. Amazing. But of course, all of this is really only the very beginning of what will be an entire book of stories. 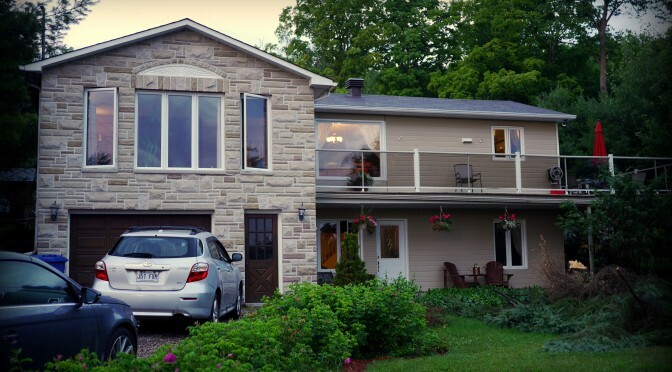 We are now in our dream home, It is gorgeous, We have an acre and a half, on a gravel, dead-end dirt road, looking out over the Gatineau hills. And when the snow flies? Well, as the son of the old owners said, it becomes a fairy tale land. They had lived in, and loved that house for 25 years, but it is now time for a new chapter in the house’s history. We have officially moved in, and are busy turning it into our HOME. There are a ton of projects, which have basically kept me hopping all day every day until 11pm, but we are loving every minute of it, and can’t wait for an official housewarming when it is ready for company! That about does it for the tale of how we ended up being ‘Chelsea Folks’, and as I write this, I’m en route to Jamaica for the Reggae Marathon, which will be my next story, so stay tuned for that one next! Till then, may your lives all be as fulfilling as mine currently feels, and remember to bank it for when you need a boost! Greetings sports fans. This post is definitely well overdue, but as you can guess by the title, I was really more focused on the R&R then I was writing a blog post 🙂 One of the best parts about deciding to take a couple months off was the fact that it would give me the chance to do a little bit of traveling. Of course, I promised Deanna I wouldn’t take any really long or exotic trips. The longest I was booked to go anywhere was Las Vegas for 2 weeks. In addition, I booked a week in Nova Scotia to visit and spend time with my dad. This post will give you a little taste of what these trips were all about, and the fun I got up to during the trips. And of course, there will be lots of pictures! Read on if you feel like heading about several national parks in the U.S. and brewery tours, along with great hikes! Running along in the open air taking in the smells of the ocean was of course one thing I did. In addition, I found out that a new craft brewery had opened up not 5km away from dad’s house. Uncle Leo’s Brewery. I convincedIn dad to join me in some tastings and meeting the owners. Some nice brews, and they keep it simple there, which was nice. I liked their porter best. I also had a chance to borrow a light and fast XC mountain bike and joined an old friend from some mountain biking in an area I never been to. I was pretty impressed with the level of riding that can be found now in the county. I’m sure it didn’t exist when I was growing up. But then again, mountain biking really didn’t exist at all! One of my only real ‘needs’ of going out east was making at least one day trip to Cape Breton. 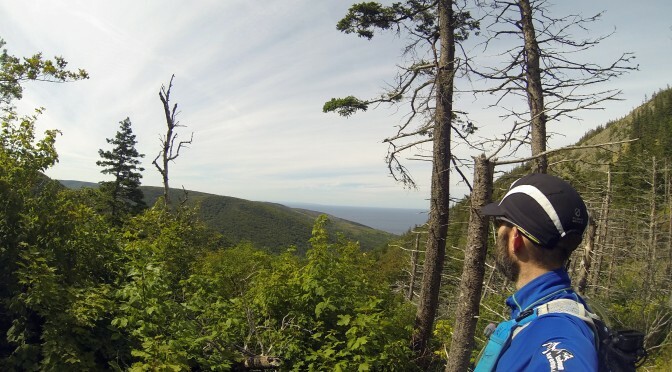 Rather than do a whole loop of the highlands this time though, I opted to just get dropped off at a trailhead in the Mabou Highlands area, and proceeded to spend a few hours hiking and running in the hills and to the ocean. It was a great getaway. Dad and Nicole spent the time having a bite to eat and touring by car in the area. Once we were all back together, we visited another craft brewery (Big Island Brewing), then drove to a brew pub in Antigonish for supper. All in all, a great day. In addition to those activities, I squeezed in few visits with old friends (including a mini grad class reunion at a pizzeria serving up the famous Pictou County Pizza. Oh yeah, and in that week, I somehow managed to simultaneously sell our current house AND buy our new place in Chelsea! A bit challenging to do all the negotiations while out of the province, but we pulled it off! After Nova Scotia, after a tough 4-day adventure race and after the stress of buying and selling a house was done, it was time to really unwind. To do that, what better place to head to than Sin City? Flights are cheap, and I actually have a couple old and dear friends that now live down there, so I had a built in HQ for all the crazy desert adventures I had planned. Vegas itself really wasn’t high on the agenda for this trip. I was really taking advantage of the proximity to the amazing sights including the Grand Canyon, Bryce Canyon, Zion National Park, Death Valley, Red Rocks Park, and the Hoover Dam. Yup, there was no shortage of things to do And thanks to Troy being free the whole time, I had someone to share some of the experiences with. For a few of the days, the focus was on sampling new beers, playing pool and disc golf, and lounging in the pool and hot tub in the hot Vegas sun. Although temperatures up north had already started falling, it was still full ‘summer’ in Vegas! I managed a bit of running in it, and also Troy and I wandered off to the Red Rocks area for a nice little day hike with great views of the city in the desert. Before and after a weeklong trip to the parks, we did find time to hit the strip twice, with a focus on music. We hit the Brooklyn Bowl to catch the Dirty Dozen Brass Band, which was amazing, and also later in the trip a visit to the Las Vegas Country Saloon to see Hank 3, which was certainly interesting, with his split of classic country and in-your-face punk! Obviously though, the highlight would be the road trips out of town. First up was a day trip with Troy’s car out to Death Valley. We left early in the morning on a weekday and made good time to get there. Skies were pretty grey, so temperatures were nowhere near the highs that they warn you about. We even went on several hikes in the full sun. It was clear that this isn’t a place to be trifled with, but given the lower temps, we were fine. We made our way all around the valley, hitting up Badwater, and the Devil’s Golf Course, as well as visiting the sand dunes. These were all pretty cool. However, our final stop was high above Badwater at a place called Dante’s Peak, which is where a surreal thing happened. It rained! And hailed! Yup, one of the driest and hottest places you can find, and I got caught out on a peak with a crazy storm with lightening, and watched the rain pouring into Death Valley. Good thing we weren’t exploring any slot canyons! Next up in the adventure was renting a car for a week so we could immerse ourselves in some of the bigger national parks. First up would be the North Rim of the Grand Canyon. We had tried to visit Zion first, but it was absolute madness there! Instead we decided to head to the farthest point on our itinerary then make our way back over the week. The North Rim was also pretty busy, so we had to set up our campsite about 12 miles out of the park. No big deal, but man was it COLD in the morning. We had FROST on the tent! We also learned from a ranger that instead of paying for camping, we could just drive on forest service roads and camp for free without permits! Our second night we did that, managing to find a spot RIGHT ON THE RIM OF THE CANYON! Yeah, for free. With a nice fire pit, and amazing views. What a discovery. In addition to the cool camping spots, we were obviously there for some hiking. Originally, we had planned on making an overnight trek down to the Colorado via a remote route, but discovered all the overnight permits were spoken for. We re-planned the trip, and instead did a nice long out and back hike via the North Kaibab Trail. We also hit the Angel Point trail, as well as another cool trail along the rim at sunset near Imperial Point (highest vertical point in the Canyon). When people say that the views are awe-inspiring, they aren’t lying. I loved every minute of the outdoor adventure in the Canyon, and tried to take pictures that would do it justice. Some were ok, but really, it is best experienced in person. The second major stop on our mini-tour was Bryce Canyon. Ironically, I hadn’t originally planned on visiting that park, as each park carries with is entrance fees, etc., so I had planned to just visit two parks. However, in the end, Troy picked up an annual parks pass, giving us access to all parks, so we figured what the heck! Plus, armed with our newfound knowledge around ‘free camping’, we got a line on some nearby forest camping we could use. I must say, I’m REALLY glad that we did make the trip here, as Bryce Canyon is an amazing sight, particularly the amphitheatre section. The colours and formations of the sandstone and hoodoos here is nothing short of otherworldly. My one takeaway from Bryce was that the scenery was probably more spectacular than the Grand Canyon, but from the perspective of hiking trails, Grand Canyon took the cake. That’s not to say that we didn’t hike though. We did in fact spend most of the day hiking all around the canyons, with every twist and turn leading to more gorgeous colours and shapes. It was definite eye candy all the way. After a full day hiking there, we drove off to a nearby national park where we found another amazing campsite with some cool hiking trails around it. We hiked high up a hill yet again over supper to enjoy another amazing sunset. We lit up out third fire in 3 days, enjoyed a couple beers, and turned in for the night. Thursday took us to the final stop in the tour: Zion National Park. Zion was pretty much my real reason for making this trip. I had seen it on various tv shows, and others had commented on how amazing this park was, so I HAD to visit. I was NOT disappointed. We arrived quite early in the morning, allowing us to nab a camping spot early, and head out on shuttle buses to explore the park. Zion is unique in that visitors can’t drive in, they have to actually take shuttle buses operated by the park to the trails and views. This protects the region, and manages traffic flow. It worked as advertised and in no time we found ourselves at the Angel’s Landing trailhead. I can’t say enough about this hike. It takes you up, up, and up, finally following a knife edge ridge trail that features chains to aid hikers. The views from the top? Well, you can see some images above. I LOVED it. Troy had turned back earlier on account of a bit of vertigo, so I was on my own up there, and for the rest of the day. After Angel’s Landing, I basically boogied my way to almost every single front-country trail in Zion National Park. This park is pristine and gorgeous. After seeing all the front trails, I realized that I will HAVE to come back and spend more time doing some of the overnight hikes that are available here. In addition to Angel’s Landing, there was another trail that follows the West Rim trail of the park to a place called Sentinel Point. Sadly, it is closed on weekdays due to maintenance. However, I learned that it would be open on Friday! Lucky me, since I’d be there in the morning :-). This was dumb luck, as we’d intended to spend Monday and Tuesday here, when the trail would have been closed. And I must say, of the entire week’s trails, this was probably my favourite. The view from the top pretty much defines for me the quintessential end of a hike. I was the first on the trail in the morning, and the first to summit at this, the highest point in the park. Sadly (or happily), my camera batteries were dead before I even started hiking, so I have no actual pictures. This just means that I’ll have to go back with Deanna to take her to the top to see the sights herself. All in all, this trip hit all the high points for me in a vacation. I got to spend time with friends. 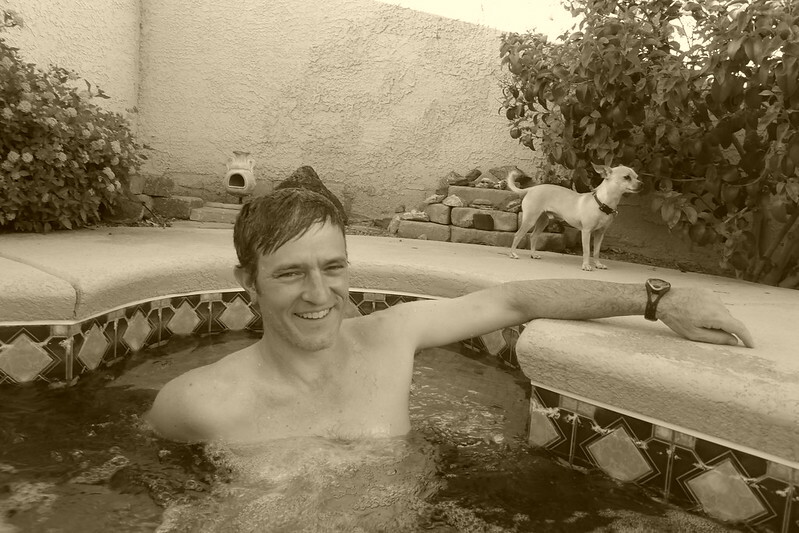 I relaxed in the sun and played my heart out, board games, pool, disc golf, hiking, running, and biking. I saw amazing new sights forged by mother nature, and by mans’ own hands. I left feeling relaxed and ready for anything. Las Vegas may be known as Sin City, but I think from here on out, I will only see it as a jumping point for amazing adventures in the Southwest. There is still so much more for me to experience, and the flight prices are awesome! That’s it for my R&R, so stay tuned for my post on my next race, which was the County Marathon…. Hello friends! Every year, whether we like it or not, we must acknowledge the passing of another year of time, and the gradual aging we all go through. My most recent birthday was not a milestone event in my mind, so I wanted to keep it low-key, but I also wanted to make sure that I marked the day by doing something I loved. With that in mind, it was quite fortuitous that Deanna and I were passed along an invite to a road trip to the Kingdom Trails in Vermont for a weekend of mountain biking and celebrating. I hesitated at first, as I was a little concerned that Deanna might not be keen on the idea of joining three more ‘seasoned’ mountain bikers in this land of amazing trails. However, as you’ll see, it turns out she was as giddy as the rest of us with the experience! Since it was my birthday weekend, we decided to make a proper road trip of it and visit different Vermont Breweries as we went. 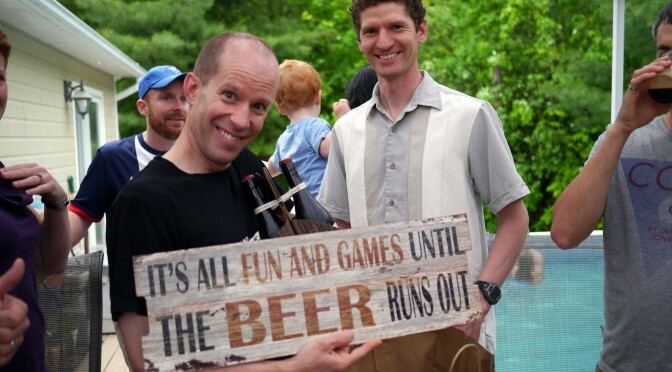 After all, Vermont is known for some great beers, as well as great scenery and mountain biking. This way, we could enjoy our drive down and back by breaking up the trip into ‘brewery segments’ 🙂 This meant a bit of advanced planning to make sure we arrived at the right times and could take advantage of tasting room opening hours. In the end, we managed to squeeze in 7 different breweries, one of which we basically had to beg to let us in to buy beer (they were officially ‘closed’ for the day). Hill Farmstead Brewery – They were ‘closed’, but I convinced them to sell me beers to take. Spend $70USD on 4 bottles! Zero Gravity Craft Brewery – Sadly, no flights or true samples, you have to actually order a pint / growler to try there suds. That being said, I got 2 decent samples out of them. Vermont Pub and Brewery – Oldest craft brewery in Vermont, final lunch stop on way home. Had a nice flight of 6 here. Needless to say, on our return to the true north strong and free, the only thing we claimed at the border was 48 bottles of beer. But of course, we were also in it for the riding. Kingdom Trails did not disappoint. 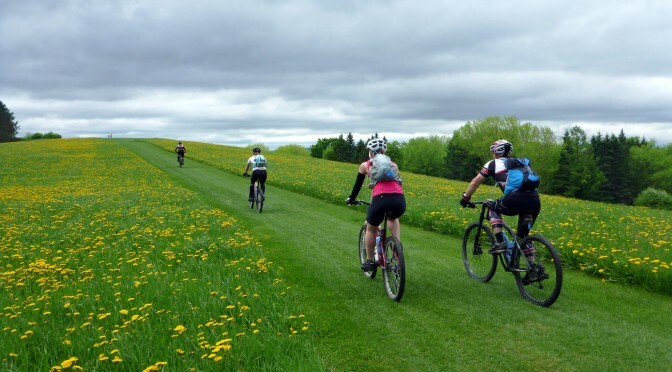 They have over 100 miles of mountain biking trails on offer, with something for everyone. You are required to buy a $15 day pass (or $75 annual pass), but for that, you get well, maintained trails, some of which had amazing flow to them. The trails are truly a testament at what can be accomplished when like-minded people come together with a common goal. The network has grown over the years, with support from the local community, including very gracious landowners. Deanna and I opted to only get a 1-day pass, with the intention of heading back earlier on Sunday to visit Burlington. The other went with 2-day passes to squeeze in a few more hours on Sunday. As a group of 5, we set out around 9:30am on Saturday, and sampled a wide range of trails, including some favourites including Kitchell, Tap and Die, Sidewinder, and Jaw. The trails are set up so that you can take relatively easy connectors between the more fun trails. Of course, there was also hills to climb, which is inevitable if you want a nice fast flowy downhill run! We ran trails that were rated from blue square up to double black diamonds, which was a great feat, given that Deanna was essentially only on her third or fourth time truly mountain biking. Although the energy may have started waning towards the end, she still had a grin from ear to ear and bought herself a t-shirt and socks to commemorate the trip, vowing that we will return! Awesome. At about 3:30pm, we were back in the main village to grab some lunch. From there, Deanna opted to head back to our cozy cabin, while the rest of us headed out for another 2.5 hours of biking, where we hit some more remote trails and found a truly epic long downhill trail called Moose Alley (we also enjoyed Farmjunk on our way). We rolled back to the cabin around 6:45pm, somewhat pooped and ready for eat and enjoy the evening. In that respect, we had hoped to cook sausages on the fire, but it was taking so long to get things going, most of them were cooked on the stovetop and served inside (personally, I *had* to cook one symbolically on the fire, and boy was it tasty!). We had a nice birthday feast (after all it was my actual birthday! ), followed by very tasty ice cream sundaes for desert. From there, beer consumption, story swapping, and eventually, in a most ‘anti-cabin’ move, streamed an episode of Naked and Afraid before hitting the hay. All in all, that was as near-perfect of a weekend that I could imagine. Thanks to Nathalie and James for organizing, and thanks to Deanna for being as excited about it as she was. I’ll be enjoying the ‘imported’ beers for a while, and dreaming of the next time I can slip down that way and tackle even more of the trails! Next up though, final preparations are underway for my upcoming 4-day expedition race in Maine at Untamed New England. Stay tuned for lots more about that in the coming month!